← Does the ASUS Lamborghini VX7 USB 3.0 Laptop Drive Us Wild? When I first heard about Delkin’s new USB 3.0 card reader, I immediately thought of my late grandfather who used to be an avid photographer. I used to see him transferring all those files to his computer and I know just how much he despised waiting for several hours as he transferred thousands of files from his DSLR. My grandfather definitely would have loved the concept behind one of these new USB 3.0 card readers. California-based manufacturer of photography accessories, Delkin, has come up with a highly anticipated storage solution to spare users the agony of long wait times. It combines the speed of USB 3.0, the portability of the memory card reader, and a price that’s budget-friendly. Meet the Delkin USB 3.0 Universal Memory Card Reader, a flash card reader that’s flaunting its transfer speeds ability that’s 12 times faster than USB 2.0. The USB 3.0 card reader has already caused excitement among many photographers and videographers as it promises theoretical 5 GB/s data transfer speed capabilities (although actual speeds have been found to be at 3.2 GB/s). Nevertheless, this will make transferring huge HD and 3D files a lot quicker and easier than the capacity of USB 2.0 devices, saving significant hours that the user could end up wasting. But if you don’t have a USB 3.0 port yet, you’d be delighted to know that Delkin’s product is also backward compatible so it can work with your USB 2.0 and 1.1 connections. Just don’t expect it to be as speedy, of course. This device is looking to sideline connections like FireWire800 because it can trim down the speed of downloading a 2-hour 1080p video to 26 seconds, 2,000 MP3 files in merely 13 seconds, and 10,000 images in barely a minute. Another even more enticing feature is that this device is compatible with five memory card slots, including UDMA enabled CompactFlash cards, SDXC enabled Secure Digital Cards, Memory Stick, and xD. The plug-and-play flash card reader is compatible with Windows 7, Vista, XP, ME and 2000 OS. It works equally well with Mac OS 9.0 and higher versions. This multi-functional beauty is now being shipped out from Delkin’s San Diego plant and with a price of $39.99, considering its portability, speed and functionality, it should be a sin to let it go, right? With $40 in your pocket, would you buy a Delkin USB 3.0 memory card reader? Don’t forget to share your thoughts! 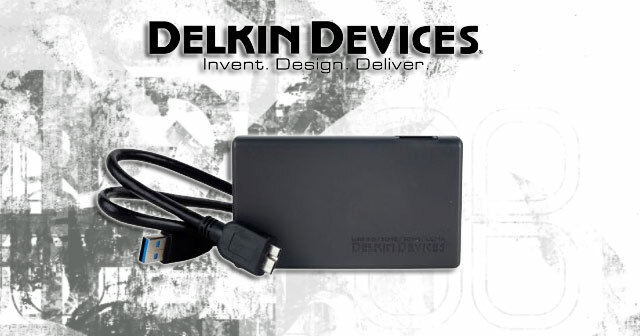 This entry was posted in Articles, Delkin Devices, Delkin USB 3.0 memory card reader, SuperSpeed USB 3.0, USB 3.0, USB 3.0 Card Reader, USB Devices, USB File Sharing, USB Gadgets and tagged Delkin, Delkin Devices, Delkin Universal USB 3.0 Card Reader, Delkin USB 3.0 Card Reader, Delkin USB 3.0 Universal Memory Card Reader, flash card reader, USB 3.0 Card Reader. Bookmark the permalink.